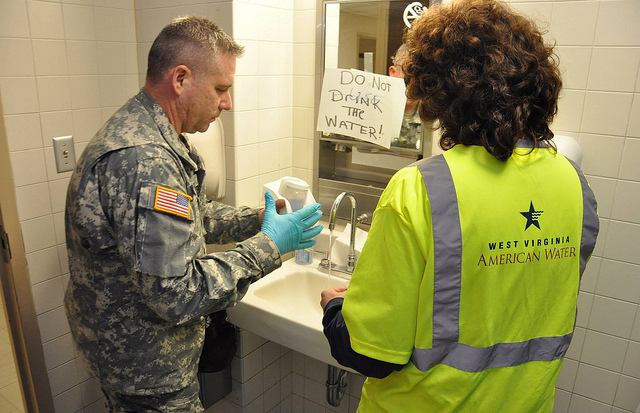 Poisoned water shut down state capital and exposed endemic carelessness in oversight. Members of the West Virginia National Guard’s Chemical, Biological, Radiological, Nuclear and High-Yield Explosive Enhanced Response Force Package draw water samples from across the Kanawha Valley to determine levels of contamination remaining in local water supply during Operation Elk River Spill. Click image to enlarge. On January 9, a chemical storage tank on the bank of West Virginia’s Elk River leaked approximately 10,000 gallons of 4-methyl-cyclohexane-methanol (MCHM), a chemical used to process coal, into the river just 1.5 miles upstream of the drinking water intake for 300,000 people in Charleston, the state capital. For five days, residents were warned not to use their tap water for any purpose—no drinking, no showering, not for washing dishes or brushing teeth. Nearly two months later, following a chorale of mixed messages about safety, many Charleston residents are still afraid to drink from their taps. 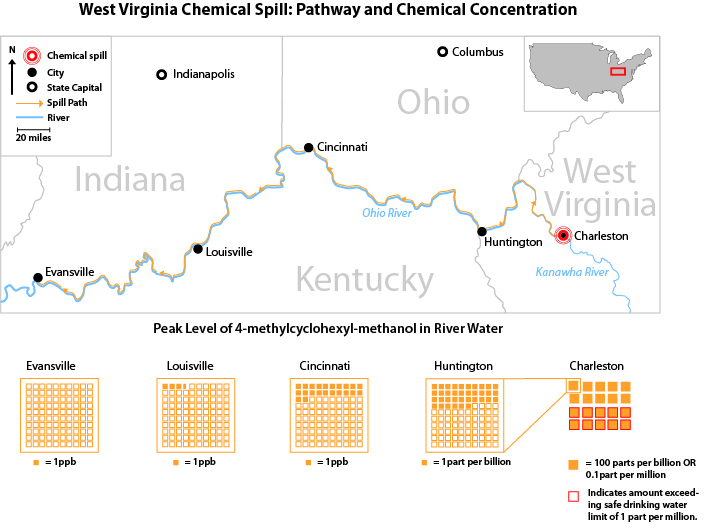 The spill elevated to public attention a pattern of disregard, weak oversight, even neglect by West Virginia and federal regulators charged by law to oversee storage of toxic chemicals, and to safeguard the environment and public health. A Circle of Blue investigation found that not only was a harmful chemical stored haphazardly near a major drinking water source, scant information was available to regulators, public health officials, and citizens about the chemical’s effects on people and aquatic species. Federal and state laws and regulations to protect drinking water sources rely on voluntary measures, with no way to force implementation of protection plans. Funding for regulatory agencies and safe drinking water programs has declined dramatically since the early 2000s, leaving almost no money to implement the voluntary protection measures. Provisions of the federal Clean Water Act meant to prevent spills of hazardous materials have not been implemented. How chemicals and other harmful substances are classified under the law often determines how strictly they are regulated. Thorough assessments of their effects on public health and the environment are rarely completed. For all intents and purposes, the West Virginia spill had its start when citizens complained to the state Department of Environmental Protection about a strong licorice odor on the river. The company that owned the storage facility, Freedom Industries Inc., did not report the incident. The local water utility, West Virginia American Water, issued a “do not use” order at 9 o’clock that evening. Local and state officials reached out to the federal Centers for Disease Control for guidance on how much of the chemical could safely be allowed in the drinking water. The CDC, initially able to find just one study about the toxicity of MCHM that was performed on rats, advised a limit of 1 part per million (ppm). Two days after West Virginia American Water began lifting the do not use orders, the CDC came back with another advisory: due to a lack of information about the health effects of MCHM, pregnant women may want to avoid the water until no trace of the chemical was found. The agency later clarified that this was precautionary, and that pregnant women are regularly advised not to consume products that are safe for others. West Virginia Governor Earl Ray Tomblin told residents “It’s your decision” whether or not to use the water. Disclosures that other chemicals were present in the leaky tank created further confusion and distrust nearly three weeks after the initial spill. 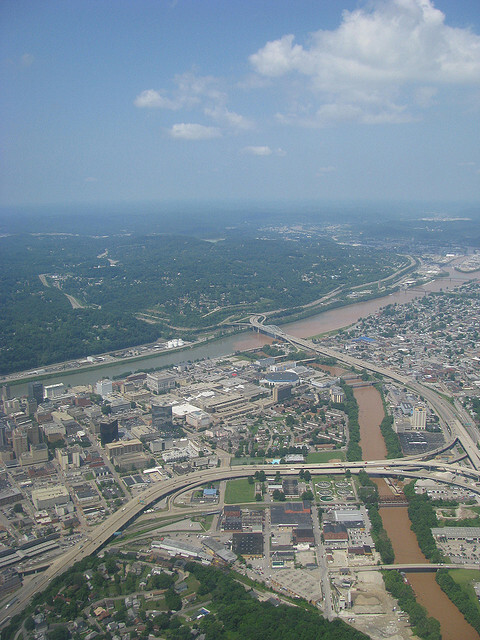 The chemical spill plume moved from West Virginia’s Elk River to the Kanawha River and eventually into the Ohio River. In West Virginia, these factors came together to create a public health emergency that shut down the state capital for days, cost the state millions of dollars in lost economic activity, and, most significantly, eroded public trust in the government’s ability to ensure the safety of drinking water . Three weeks after the West Virginia spill, tens of millions of gallons of coal ash and water were spilled from a Duke Energy plant into the Dan River in North Carolina. Drinking water had to be treated downstream in Virginia, and the massive coal ash leak’s effect on aquatic life is not yet known, revealing similar oversight problems, according to a report from The New York Times. That accident, too, was accompanied by a folly of miscommunication, confusion, and regulatory neglect, according to early assessments by the state Environmental Review Commission. Both pollution events have implications beyond West Virginia and North Carolina. They appear to be symptomatic of the nation’s diminishing capacity, after decades of political attack, to enforce environmental and public safety statutes. In the duel between Democrats seeking to expand the reach of state and federal environmental and community safety agencies, and Republicans seeking to shrink government and regulatory oversight, the GOP is clearly winning. At $US 8.2 billion in fiscal 2014, the EPA budget is $US 200 million less in real dollars than it was in 2004, and 26.5 percent less in inflation-adjusted dollars, according to federal budget documents. The agency’s staff, which numbered 18,000 full-time employees in 2001, now numbers 16,870, according to the budget documents. Similar reductions have occurred in the budgets of state community health and environmental agencies during the same period, according to state budget reports. The toll of such weakened resolve to safeguard the environment and health is now apparent across the country. Agricultural pesticides and toxic waste dumps are contaminating drinking water sources in rural California communities, a trend that started decades ago and has not been addressed. In Lake Erie, phosphorus pollution from agriculture and industry has led to toxic algal blooms that shut down a public water supply for the first time ever last fall. The West Virginia Bureau of Public Health hired contractors to conduct the required assessments between 2001 and 2003, but many have not been updated since then. The latest assessment for the Kanawha Valley system was completed in 2002, and the publicly available report does not list specific contamination sources. More detailed assessments are available to public water utilities if they request more information, Bill Toomey, the program manager for WVBPH’s Source Water Assessment and Wellhead Protection Program, told Circle of Blue. Still, the Kanawha Valley assessment should have identified the chemical storage facility as a potential contamination source because it held a stormwater discharge permit, which would have shown up during the BPH’s database search of state-permitted facilities within a “zone of critical concern” upstream of the drinking water intake. But it is easy for this information to stop at the assessment. 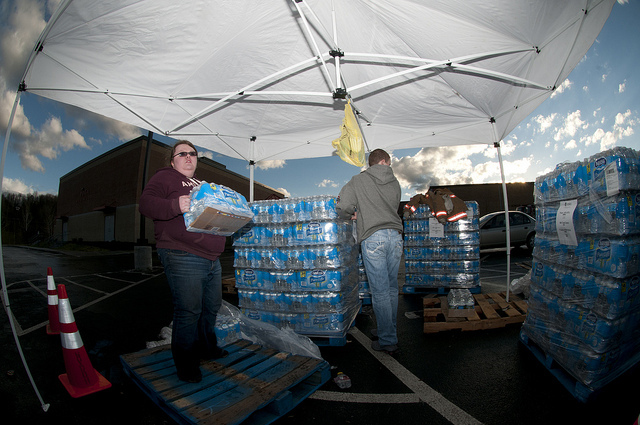 Bethany Whisman and Blake Kenney, both of Poca, W.Va., volunteer by handing out cases of bottled water to those affected by the Elk River water contamination on Jan. 11, 2014, at Poca High School, Poca, W.Va. Residents of Kanawha, Boone, Putnam, Lincoln, Logan, Clay, Roane and Jackson counties were told to stop using tap water after a chemical leak contaminated the West Virginia American Water company’s system in those areas. Click image to enlarge. He added that, based on questionnaires sent out by WVBPH, approximately 220 water systems in the state have created some sort of protection plan. “Mind you, we’ve got about 1,000 water systems in the state, and we’ve got about 281 that we would refer to as community supplies—those would be water systems that serve water year-round to at least 25 customers or 15 service connections,” he said. Again, the problem is keeping the plans updated, implementing the plans, and finding the funding to do both. West Virginia’s initial assessments were completed with help from one-time EPA funding meant to help states meet the new requirements outlined by the 1996 SDWA amendments. States were allowed to take 10 percent of their allotment under the Drinking Water State Revolving Fund to conduct the assessments. Since then federal funding has not specifically targeted source water protection plans. The Drinking Water State Revolving Fund has seen its overall funding drop in the last few years from $US 919 million in 2012 to a requested $US 817 million for fiscal year 2014—the lowest amount ever in inflation-adjusted dollars since the program’s inception in 1997. Of that, West Virginia would receive 1 percent, or approximately $US 8 million from the DWSRF. Other pieces of federal legislation, including the Clean Water Act, could have helped prevent the spill if properly implemented. The CWA’s pollution prevention program—which requires polluters to obtain permits and report discharges—does not cover facilities that don’t make regular discharges of waste material, explained Jon Devine, a senior attorney for the Natural Resources Defense Council. So while a chemical manufacturing facility would require a permit, a chemical storage tank does not. The Act does, however, allow for regulations that require storage tanks to take spill prevention measures. But the only storage tanks that are currently covered by the Clean Water Act are those that contain oil products. The Act calls for similar regulation of tanks that hold hazardous substances, but rules to implement this measure have not been made in the 42 years since the law was passed. He added that the Act, as currently implemented, might allow for some enforcement action to be taken retroactively, but it did not have the reach to regulate the Freedom Industries facility proactively. The Elk River flows into the Kanawha River in Charleston, W.Va in 2007. A chemical spill occurred in the Elk River on January 9, 2014. But even if such a program was implemented, Devine said, the material being stored in a tank would have to be considered hazardous under federal law before the tank would be subject to regulation. MCHM is not considered to be a hazardous substance. Though some materials and chemicals are inherently more dangerous to humans than others, there is no real scientific difference between a chemical that is “hazardous” and one that is merely considered “toxic”. Those distinctions are largely created for political reference, according to Steven Gilbert, director of the Seattle-based Institute for Neurotoxicology and Neurological Disorders (INND). But the distinction matters when it comes to regulation. The chemical storage site responsible for the West Virginia spill, operated by Freedom Industries, is a prime example. The site escaped regulatory inspections for years. This was largely because of the material being stored in the tanks and the provisions of the nations various toxic and hazardous waste storage and disposal laws. To complicate matters, the term “hazardous” can be applied to the same material differently depending on the law. CERCLA, the Comprehensive Environmental Response, Compensation, and Liability Act, enacted in 1980, primarily governs the release of hazardous waste from old industrial sites. RCRA, the Resource Conservation and Recovery Act, enacted in 1976, regulates how hazardous wastes are disposed. EPCRA, the Emergency Planning and Community Right-To-Know Act, enacted in 1986, requires companies to provide information about the location and quantity of certain hazardous materials to federal, state and local officials. The lack of chemical safety information has its roots in the federal Toxic Substances Control Act (TSCA). TSCA, enacted in 1976, gives the EPA the authority to assess, approve, and regulate commercial chemicals, of which there are 83,000 currently used in the U.S. There have long been problems with the law. To start, approximately 62,000 existing chemicals, including MCHM, were grandfathered into TSCA when it was passed in 1976, meaning there is scant formal scientific data available about their effects on human health. The law has not been updated since. Safety information is therefore scarce for many existing chemicals. In the case of MCHM, the CDC could initially find just one toxicity study, in which rats were given daily oral doses of MCHM for 28 days. It was this study on which the CDC based the 1ppm drinking water limit, after accounting for uncertainty. Later, six other studies were found, but they primarily addressed acute toxicity—the harm caused by a short-term exposure to the chemical. This included studies of the consequences of skin exposure and eye exposure. However, none of the studies addressed reproductive, developmental or chronic toxicity, which would have provided information about the chemical’s safety for pregnant women and children, as well as potential long-term exposure effects. All of the studies were conducted by a lab contracted by the chemical manufacturing company, a standard practice in chemical toxicity testing. Yet safety information gaps exist even for chemicals introduced following the implementation of TSCA. Safety data is still primarily furnished by the manufacturing company, which is required to submit all available toxicity data to the EPA in a Pre-manufacture Notice (PMN). Companies are not, however, required to submit a standard set of toxicity tests. The EPA has 90 days to review each notice and make a regulatory decision about the new chemical. If the EPA determines that a chemical poses an “unreasonable risk” to human health and the environment, it can require companies to provide more safety data, or it can regulate how the chemical is produced and used. According to the EPA’s website, 90 percent of new chemical notices are approved without any regulatory action taken. During the 2013 fiscal year, the agency received more than 1,000 notices for new chemicals, and had a New Chemicals Program budget of more than $US 13 million. INND’s Gilbert called the TSCA “broken” and said the current regulatory framework puts the burden of proof on the wrong parties. “Industry should have the requirement to demonstrate safety, but right now it’s flipped where the government and us, the people, have to demonstrate harm,” Gilbert told Circle of Blue. He added that other federal programs, like those that assess and regulate pesticides and drugs, require much more thorough toxicology information. Tests like this, and their availability to emergency responders and the public, are extremely important for preventing disasters like the West Virginia spill, according to Maya Nye of the People Concerned About Chemical Safety. Evan Hansen, the president of Downstream Strategies, an environmental consulting company in Morgantown, W.Va., is hopeful that the chemical spill has focused enough attention to spur action. There is another layer to the regulatory mix which is the RCRA which stands for Resource Conservation Recovery Act. That is designed to ensure that no hazardous waste makes it into the environment. The critical realization is that the instant a substance gets out of its package, it becomes waste and is subject to this law. This is where Freedom Industries really messed up. Since all tanks, pipes, pumps, conveyors, whatever, eventually leak or spill, the requirement is to have a plan and system in place to catch or contain the spill and keeping it from getting into the environment. The requirement is to have a containment wall around tank farms to catch and contain the contents of the largest tank. The containment wall must be impermeable to the material in the tank. Employees must be trained to react to a spill. Clearly neither the containment nor employee education was adequate because the chemical flow into the river occurred for more than 24 hours. Very nice post-mortem on the institutional weaknesses that turned the (avoidable?) spill into a disaster.